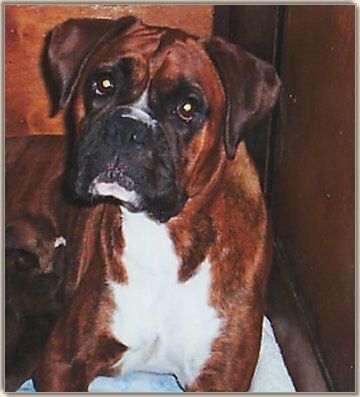 Ellen Pandelis is well known for her obedience and agility trained boxers. Ellen and her daughter Rebecca trained Harry at aged 7 in Agility and he gained his Jumping title at the the age of 8 years. Cleo was only shown sparingly but placed at most shows. Cleo has one qualifier towards her JD title. Amy gained her obedience title in 3/3 attempts, winning 1 and placing at the other 2 and going best utility (breed) dog in trial. 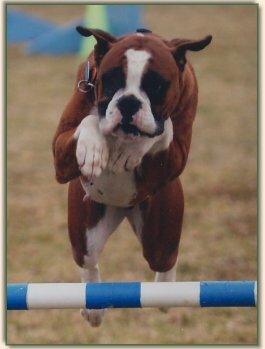 Agility: first boxer in NSW to gain her ADX and JDX . 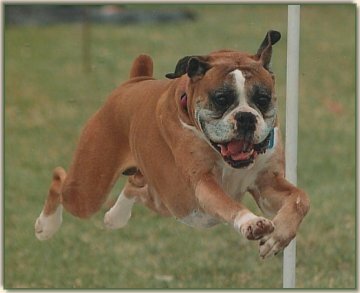 Amy WON the Agility at the 1998 prestigious SYDNEY ROYAL SHOW, to date she still holds that honour to be the only boxer to have won an agility trial at an Australian Royal Show. 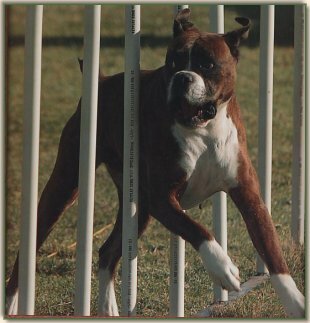 Amy won and placed in many trials in open all breeds competition and was runner up winner of winners at the 2002 Boxer Club of NSW Nationals at the age of 8. Amy competed in her final trial 2 weeks later 2002 Sydney Royal Show and qualified and placed in the Open Class (ADX) for a qualifying pass and placed again at the age of 8 years old as her 'GRAND FINALE'. Amy never let me down.!! 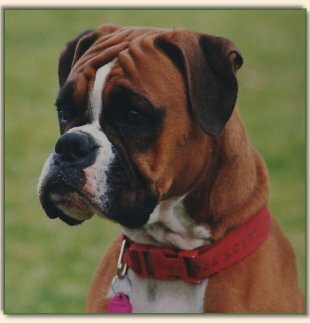 Kaila was an outstanding Boxer at everything she attempted, very sadly lost to cancer at 4 yrs 8mths. 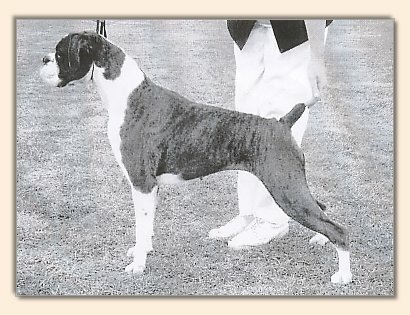 Won or placed at most of her trials in open all breeds competition. 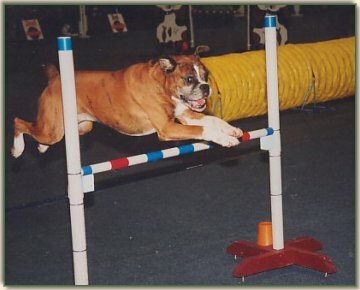 Gained all her agility titles by 4 years of age. Has won many all breeds trials, most of her wins, were at ADX and masters level. 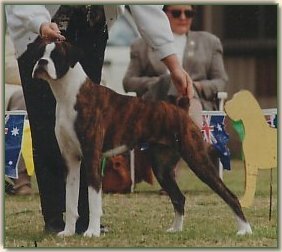 Winner of Winners at 2002 Boxer Club of NSW Nationals in both Agility and Obedience. Gained her CD in 3/3 attemps winning 1st place and going on to be winner of winners and third place in Sydney Royal Easter show her second trial and qualified and titled the following week at her 3rd trial. To date Ashleigh is still the only ADM JDM titled Boxer in NSW. Lightly trialed only but has won and placed at most of her trials in open all breeds competition. 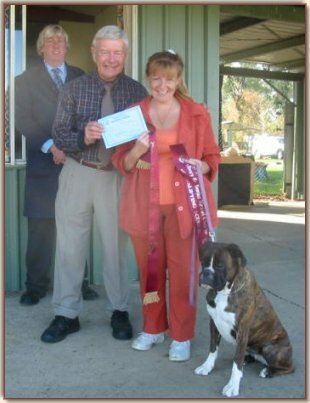 After gaining her Australian Championship at 2yrs old in Conformation, she raised her family (2 of which are Australian Chamions) she commenced doing her Obedience late 2006 gained her title in 3 attempts placing at 2 on a score of 97/100 at both. 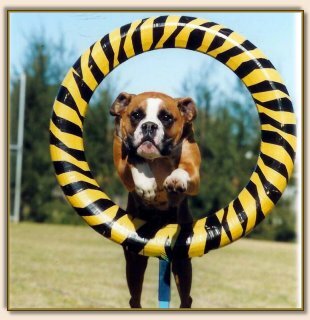 Rosie started her agility career in New Zealand and has continued her winnning ways since moving to Australia in 2007. 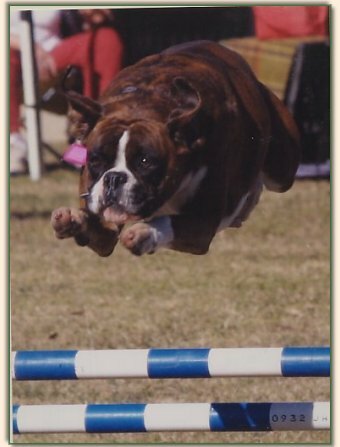 From her first 5 events in Australia she won 13 top 3 placings in agility and jumping trials. In just a few events over the first 3 months of 2008 she won 4x 1st places, 4x 2nds, 3x 3rd placings as well as several other qualifying certificates. In less than a year in Australia she has earned her ANKC AD, JD, ADX, & JDX titles and also the BAAD & AAD titles from the Agility Dog Assoc of Australia. 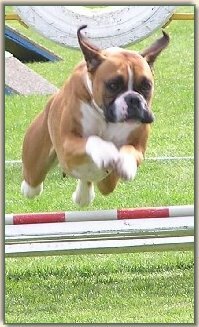 She is well on her way to earning more titles and is now competing at the highest level (Masters) in Agility and Jumping. 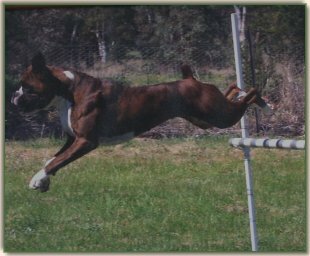 The highlight of Rosie's agility career in Australia so far was the Canberra Royal 2008 where Rosie won two 1st places and two 2nd places in the ADX and JDX classes, as well as other placings and qualifying certificates.